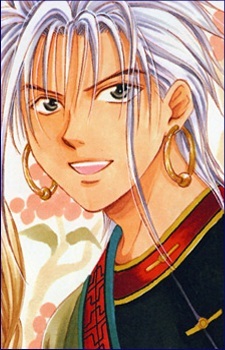 Tokaki is a Byakko Celestial Warrior married to the beautiful and kind Subaru. Extremely lecherous in nature, Tokaki takes it upon himself to comment on any attractive young woman he comes across, including Miaka. Despite his womanizing habits, Tokaki loves Subaru dearly and would go to any length to protect her. He cares deeply for Tatara and Tamahome, whom he sees as a son. He is 109 years old, but only appears 19 years old. Tokaki's power is teleportation and is supplemented by his knowledge of pressure points as well as his use of earrings as weapons. Because he kept picking up other women, Subaru threw him out of their house and Tokaki ended up traveling around the four cardinal realms. While traveling in Konan, he came across a young Tamahome. Realizing that the bullied child was a Celestial Warrior, he trained Tamahome in martial arts so that he could one day protect his priestess. They meet again when the Suzaku Warriors travel to Sairō to find Byakko's Shinzaho, though it is not a happy reunion. Tokaki, seeing that Miaka and Tamahome are in love, knows from experience that they cannot wish to be together because once a priestess fulfills her duty in the book, she must return to her own world. Believing that it would be kinder if Miaka and Tamahome ended their relationship willingly rather than being forced apart like Tatara and Suzuno, Tokaki tries to encourage a romantic relationship between his adopted daughter Xi-Fang and Tamahome. It is suspected that Tokaki and Subaru die together near the end of Fushigi Yûgi as the spell Subaru casts on their bodies has the unfortunate effect of damaging their internal organs beyond repair. However, they are seen in the novel version of Eikoden, which takes place 10 years after the original story of the book. His true name is Ranva Ham, born under the star Legs.